Living in Hawaii, sometimes it’s easy to take our island culture for granted. When a college friend came for a visit earlier this month, I was amazed and humbled by the opportunities to explore Hawaiian culture – for free. From ‘ukulele and hula lessons to concerts and performances, I’ve compiled a list of free, on-going Hawaiian performances, classes, and tours on Oahu for 2012. I checked newspapers and double-checked company websites. Please let me know if there are any mistakes or if an event is no longer free. The list of activities is overwhelming, and it’s not just for tourists. Why not choose an activity and immerse yourself in Hawaiian culture? * Hawai‘i State Art Museum:10 am to 4 pm, Tuesday through Saturday (closed all holidays) on the second floor at No. 1 Capitol Building, 250 South Hotel Street in Honolulu. Showcases work by Hawai‘i artists. Free. Visit http://www.hawaiistateartmuseum.org/ or call 586-0900. * Short films about Hawaii: 10 am to 10 pm daily at the Kaulani Heritage Room at the Royal Hawaiian Center in Waikiki, Building C, Ground Level. There are three 7-minute films: Hanohano Helumoa, the story of Waikiki; I Mua Kamehameha, the story of Princess Bernice Pauahi Bishop and her legacy, Kamehameha Schools; and Hawai‘i Mau a Mau, about Native Hawaiians today. Free. Visit http://www.royalhawaiiancenter.com/hawaiian-heritage or call 922-2299. * Hula lesson:10 to 11 am, and noon to 1 pm daily on the third floor of the Waikiki Shopping Plaza in Waikiki. Visit http://waikikishoppingplaza.com/event-calendar/. * Beginning ‘Ukulele lesson: 4 to 4:30 pm daily (check in 3:50 pm) at UKEBOX in the Pacific Beach Hotel in Waikiki. Learn the proper techniques for basic strumming and the first three chords. Free. Visit http://www.theukebox.com/#!lessons or call 922-7823. * Lau hala weaving class:9 am to 2 pm, Mondays and Fridays at Native Books/Na Mea Hawaii at Ward Warehouse. No charge to weave. Visit http://www.wardcenters.com/Shopping/Merchants/NativeBooksNaMeaHawaii.html or call 228-3261. * Lomi lomi Hawaiian massage class:11 am to noon Mondays and Wednesdays at the Royal Hawaiian Center in Waikiki, Level 1, Building A. Free. Visit http://www.royalhawaiiancenter.com/hawaiian-heritage/cultural-classes or call 922-2299. * Historical tour of Pualeilani:11:30 am to 12:30 pm Mondays, Wednesdays, and Fridays at the Hyatt Regency Waikiki Beach Resort and Spa, in the Great Hall (near the waterfall). Take a guided walk through an area of the Queen Kapiolani estate (Uluniu, Kalakaua, Kaiulani and Koa avenues) and learn about Hawaiian alii (royalty) and culture. Free. Call 237-6135. * Lei making class: 1 to 2 pm, Mondays at Aunty Bella’s Lei Stand in the Royal Hawaiian Shopping Center in Waikiki. Free. Visit http://www.royalhawaiiancenter.com/hawaiian-heritage/cultural-classes or call 922-2299. * Polynesian Show: 7 pm and 8 pm Mondays, Tuesdays, Thursdays, and Fridays on the first floor (7 pm) and third floor (8 pm) of the Waikiki Shopping Plaza in Waikiki. From the “haka” of New Zealand to the “auana” of Hawaii, Poly Pride Productions highlights the many dances and instruments of Polynesian culture. Free. Visit http://waikikishoppingplaza.com/event-calendar/. * Kapa Kuiki Hawaiian quilting class: 9:30 to 11:30 am Tuesdays at the Royal Hawaiian Center in Waikiki, Level 3, Building A. Free. Visit http://www.royalhawaiiancenter.com/hawaiian-heritage/cultural-classes or call 922-2299. * ‘Ukulele lesson:10 to 11 am Tuesdays, Wednesdays, Thursdays, and Fridays at the Pa‘ina Lanai food court at the Royal Hawaiian Center in Waikiki. Free. Visit http://www.royalhawaiiancenter.com/hawaiian-heritage/cultural-classes or call 922-2299. * Hula lesson:11 am to noon Tuesdays at The Royal Grove at the Royal Hawaiian Center in Waikiki. Free. Visit http://www.royalhawaiiancenter.com/hawaiian-heritage/cultural-classes or call 922-2299. * Hula Show:4:30 to 6 pm Tuesdays at the Waikiki Beach Walk in Waikiki, on the green fronting Oasis Lifestyle and Mahina. Halau Ka Waikane Lani Maile perform auwana hula, with live music and hula lessons. Free. * Hawaiian entertainment: 6 to 7 pm Tuesdays, Wednesdays, Thursdays, and Fridays at The Royal Grove at the Royal Hawaiian Center in Waikiki. Free. Visit http://www.royalhawaiiancenter.com/hawaiian-heritage/cultural-classes or call 922-2299. * ‘Ukulele lesson: 10 to 11 am Tuesdays, Wednesdays, Thursdays, and Fridays at the Pa‘ina Lanai food court at the Royal Hawaiian Center in Waikiki. Free. Visit http://www.royalhawaiiancenter.com/hawaiian-heritage/cultural-classes or call 922-2299. * Lomi lomi Hawaiian massage class:11 am to noon Mondays and Wednesdays at Royal Hawaiian Center in Waikiki, Level 1, Building A. Free. Visit http://www.royalhawaiiancenter.com/hawaiian-heritage/cultural-classesor call 922-2299. * Historical tour of Pualeilani: 11:30 am to 12:30 pm Mondays, Wednesdays, and Fridays at the Hyatt Regency Waikiki Beach Resort and Spa, in the Great Hall (near the waterfall). Take a guided walk through an area of the Queen Kapiolani estate (Uluniu, Kalakaua, Kaiulani and Koa avenues) and learn about Hawaiian alii (royalty) and culture. Free. Call 237-6135. * Polynesian Cultural Center show: 11 to 11:45 am Thursdays and Saturdays at The Royal Grove at the Royal Hawaiian Center in Waikiki. Free. Visit http://www.royalhawaiiancenter.com/hawaiian-heritage/cultural-classes or call 922-2299. * Hula lesson:4 to 5 pm Thursdays at The Royal Grove at the Royal Hawaiian Center in Waikiki. Free. Visit http://www.royalhawaiiancenter.com/hawaiian-heritage/cultural-classesor call 922-2299. * Hawaiian entertainment:6 to 7 pm Tuesdays, Wednesdays, Thursdays, and Fridays at the Royal Grove at the Royal Hawaiian Center in Waikiki. Free. Visit http://www.royalhawaiiancenter.com/hawaiian-heritage/cultural-classes or call 922-2299. * Hanauma Bay Education Program :6:30 pm Thursdays at Hanauma Bay, 100 Hanauma Bay Road. Watch an educational film or listen to Hawaii’s researchers and environmental leaders speak about their work. Check events calendar for monthly themes and topics. Free. Visit http://hbep.seagrant.soest.hawaii.edu/community-outreach or call 397-5840. * Polynesian Show: 7 pm and 8 pm Mondays, Tuesdays, Thursdays, and Fridays on the first floor (7 pm) and third floor (8 pm) of the Waikiki Shopping Plaza in Waikiki. From the “haka” of New Zealand to the “auana” ofHawaii, Poly Pride Productions highlights the many dances and instruments of Polynesian culture. Free. Visit http://waikikishoppingplaza.com/event-calendar/. * Lau hala weaving class:9 am to 2 pm Mondays and Fridays at Native Books/Na Mea Hawaii, Ward Warehouse. No charge to weave. Visit http://www.wardcenters.com/Shopping/Merchants/NativeBooksNaMeaHawaii.html or call 228-3261. * Royal Hawaiian Band concert: 12 to 1 pm most Fridays at on the ‘Iolani Palace grounds, 364 South King Street, weather permitting (call to confirm). Free. Visit http://www.iolanipalace.org/index.php/events/royal-hawaiian-band-concerts.html or call 922-5331. * Lei-making class: 1 to 2 pm Fridays at Royal Hawaiian Center, Level 1, Building A. Free. Visit http://www.royalhawaiiancenter.com/hawaiian-heritage/cultural-classes or call 922-2299. * Beginning adult ‘ukulele class: 9:30 to 10:30 am Saturdays with Aunty Puanani Higgins in the Aupuni Art Place at Native Books at Ward Warehouse. Please bring your own ‘ukulele. Free. Visit http://www.wardcenters.com/Shopping/Merchants/NativeBooksNaMeaHawaii.html or call 596-8885. * Polynesian Cultural Center show: 11 to11:45 am Thursdays and Saturdays at The Royal Grove at the Royal Hawaiian Center in Waikiki. Free. Visit http://www.royalhawaiiancenter.com/hawaiian-heritage/cultural-classes or call 922-2299. * Hula Kahiko performance: 6 to 6:30 pm Saturdays at The Royal Grove at the Royal Hawaiian Center in Waikiki. Free. Visit http://www.royalhawaiiancenter.com/hawaiian-heritage/cultural-classesor call 922-2299. * Na Mele Nei Concert: 1 to 3 pm first Sunday at the amphitheater at Ward Warehouse. A special guest artist or group will perform, followed by the Na Mele Nei Backyard Gang, presenting Hawaiian music, hula, and stories. Hosted by Ellen Martinez and sponsored by Na Mea Hawai‘i. Free. Visit http://www.wardcenters.com/Shopping/Merchants/NativeBooksNaMeaHawaii.html or call 596-8885. * Hawaiian language: 6 pm first Tuesday at Liliha Public Library,1515 Liliha St. Quick introductory “60-Minute Hawaiian” session repeated since 1974 by volunteers of the Program to Preserve Hawaiian Place Names. Arrive on time for handout distribution. Free. Call 587-7577. * Royal Hawaiian Band concert: 1 to 2 pm first and third Thursdays at the Royal Grove in the Royal Hawaiian Center in Waikiki. Free. Visit http://www.royalhawaiiancenter.com/hawaiian-heritage/cultural-classes or call 922-2299. * ‘Iolani Palace tours: 9 am to 3 pm, second Sunday at ‘Iolani Palace, 364 South King Street. Guided tours are offered every 15 minutes between 9 am and 2 pm; audio tours are offered every 15 minutes between 2:30 and 3:30 pm. Free for local residents. Visit http://iolanipalace.org/index.php/visit/kamaaina-sunday/13.html or call 522-0832. * Honolulu Academy of Arts Family Sunday: 11 am to 5 pm, third Sunday at the Honolulu Academy of Arts, 900 South Beretania Street, Honolulu. There are keiki crafts, a “gallery hunt,” entertainment, and a film. Don’t miss the “Arts of Hawaii” exhibit in Gallery 29 (on the second floor, above Gallery 28). Free. Visit http://honoluluacademy.org/events/bank_of_hawaii_sunday or call 532-8700. * Meet Hawaiian practitioners: 12 to 4 pm third Sunday at Native Books/Na Mea Hawai‘i at Ward Warehouse. Meet talented Hawaiian artisans working on their latest projects. Free. Visit http://www.wardcenters.com/Shopping/Merchants/NativeBooksNaMeaHawaii.html or call 596-8885. * Kanikapila: 1 to 4 pm third Sunday at Waimea Valley. Hawaiian music jam session for all ages and skill levels; bring your own instrument (and cable, if needed) or just sit back and enjoy the music. No outside food or drinks. Free. Call 757-1430. * Na Mele No Na Pua Sunday Showcase:5 to 6 pm third Sunday on the Plaza Stage at the Waikiki Beach Walk. Features Hawaii performers in a casual, family-style setting, sponsored by Outrigger. Free and open to the public. Visit http://waikikibeachwalk.com/play_details.aspx?playid=55. * Royal Hawaiian Band concert: 1 to 2 pm, first and third Thursdays at the Royal Grove in the Royal Hawaiian Center in Waikiki. Free. Visit http://www.royalhawaiiancenter.com/hawaiian-heritage/cultural-classes or call 922-2299. * ‘Ukulele lesson: 5 to 7 pm, third Thursday at the Center Court in Windward Mall, 46-056 Kamehameha Highway in Kaneohe. All ages and ability levels welcome. Instrument tuning begins at 5 pm; lesson starts at 6 pm. Free. Visit http://www.windwardmall.com/events/event-calendar/ or call 235-1143. * Natural Treasures of Hawai‘i Lecture Series: 5:30 to 7 pm, last Wednesday at the ING Direct Café, 1958 Kalakaua Avenue in Waikiki. A monthly lecture series about the unique plants and animals that inhabit Hawai‘i’s lands and seas, presented by the Hawai‘i Conservation Alliance. Check events calendar for lecture topic. Free. Visit http://hawaiiconservation.org/activities/lecture_series or call 687-6151. Our government has been very open-handed with providing for our needs, even when we don’t want it. And maybe shouldn’t accept it. For the Supplemental Nutrition Assistance Program (SNAP) alone, the Hawaii Department of Human Services spent over $33 million each month to help over 77,000 households in fiscal year 2011. That’s up from $14 million each month to help over 47,000 households in fiscal year 2008. First, let’s be honest. We can call it “aid to families with dependent children” or “supplemental nutrition assistance,” but it’s welfare: temporary assistance for those in need. It is not meant to be a lifelong benefit. Second, let’s concentrate on reforming welfare for the needy. We’ll brainstorm about solutions for Social Security, Medicare, and Medicaid at another time. 1. Limit welfare benefits to 48 months. Hawaii could limit welfare benefits to 48 months, but continue forms of support: food stamps, Medicaid, child care, and emergency services. In September 2011, Michigan Governor Rick Snyder signed into law a four-year lifetime limit on cash welfare benefits, with exemptions for the elderly and the disabled. Six other states – Illinois, Iowa, Minnesota, Missouri, Ohio, and Wisconsin – have five-year limits on welfare, while Indiana has a two-year limit for adults. 2. No welfare benefits for underage mothers. We need to encourage teens to finish school and find a job, instead of making it easy for them to be irresponsible. Let’s channel welfare money into 1) shelters for mothers who lack the support of their families; and 2) daycare programs so that mothers can finish school. 3. Reduce welfare benefits for single mothers (excluding widows) and encourage “co-parents.” Welfare encourages single-parent families and discourages responsible fatherhood. Instead, we should encourage two-parent families and marriage. Why not allow a mother and a supporting family member or friend to apply as co-parents? 4. No increase in welfare benefits if you have more children. Higher benefits reward irresponsible pregnancies. Instead, welfare assistance should allow for the number of dependent children at the time of the welfare application. 5. Reward families who no longer need assistance. After one year without welfare assistance, let’s reward families with a small, one-time grant that could be used as a down-payment on a home or car, or a necessary medical expense (only specific uses would qualify). It would offer families a small “savings” (some of the money they would have received from welfare during that year) that may help them just when they need it most. Political commentator Lawrence Auster warned, “Once the government becomes the supplier of people’s needs, there is no limit to the needs that will be claimed as a basic right.” Welfare is not a right; it is a safety net. What do you think? I hope your new year is off to a great start! We’re back to work, back in school, and clinging firmly to our resolutions (or celebrating defiantly)! While the holiday celebrations are still fresh in my mind, I thought I’d share some suggestions for having a better, more thoughtful, less stressful Christmas season in 2012. * Host a “Secret Santa” gift exchange (with a top dollar amount) instead of exchanging gifts with everyone on your list. It will take the pressure off buying a lot of gifts (and spending a lot of money), while encouraging more thoughtful and personal gifts. I’d love to do this in my family, but so far people are resisting the idea. * Get crafty with gift wrap. Wrap gift cards in a restaurant take-out menu or a page from the store’s catalog, instead of buying gift card envelopes. Use children’s artwork to wrap small gifts, instead of buying wrapping paper. Use recycled bags for larger gifts, instead of buying gift bags. * Decorate the grounds with floral arrangements, elegant Hawaiian quilt patterns, or kahili (feathered standards) in keeping with the majesty of the Palace. If lanterns are a must, use simple white lanterns strung between the trees on the grounds, instead of the bright red, green, and striped lanterns. * Consider transforming the Electric Light Parade into a Solar Light Parade, and hold it in the late afternoon. It will reflect our commitment to alternative energy, showcase our beautiful Hawaiian flowers and artists, and allow us to see the people in the parade in the daylight. * Invite children to design a Honolulu City Lights commemorative ornament. They could even turn the winning ornament artwork in different age categories into a set of notecards. * Publicize a request that Electric Light Parade attendees leave their strollers in the car. This will make it easier and safer to walk on sidewalks, especially after dark, without running over toes or creating pedestrian bottlenecks. * Start a Christmas tree decorating contest. Each school could choose a theme, create hand-made ornaments, and share their creativity with other schools. Last year,Ward Centers hosted a Christmas Tree Decorating Contest for Hawaii intermediate and high school students, but I think it would be fun for elementary students too – and a great way to encourage art in school. * Show kids that we appreciate their generosity. Last year, Ma‘ema‘e Elementary School hosted a holiday assembly, complete with a visit from Santa, as part of a toy drive for the Lokahi Giving Project. Other schools are low-key, quietly accepting toy donations; but I think it’s better to thank kids for their giving. Students shouldn’t be required to participate; but if money is a concern, students could raise money or volunteer as a class. How can you make the holidays better this year? What changes would you make around town to improve the holidays? The International Market Place in Waikiki. As a kid, I saw it as a place where adventures could happen. As an adult, I see it as a way for people to start a micro-business and form a community with other micro-business owners. But last month, just before the end of the year, I was surprised to read a small article in “Pacific Business News” that reminding us that the iconic International Market Place in Waikiki (along with the Miramar Hotel) will be demolished and redeveloped in 2013. The new project will involve “a new three-level retail, dining and entertainment center” (“Waikiki’s International Market Place, Miramar Hotel to be razed under redevelopment plan” 12/28/11). The development has been planned for years, but I couldn’t believe that they would actually tear down the International Market Place. I know that it’s not an “authentic” Hawaiian experience. I know that some people would consider it a “tourist trap” full of small stalls and narrow walkways. I know that it has become out-of-place in upscale, beautified Waikiki. But I also know that it’s a fun, informal, and interesting place to wander around, without feeling as if you’re under-dressed. I remember strolling along the winding path, just a little lost, in search of those elusive souvenir penny machines. There’s a beautiful, towering banyan tree; I look up and appreciate this exceptional tree, the hub of the Market Place. Consolidated’s Waikiki Theatres have been closed since 2002; the Waikiki IMAX Theatre lasted a little longer, but admitted defeat in 2003. Further down Kalakaua Avenue, Niketown in the King Kalakaua Plaza, a four-story shopping and entertainment complex, has been vacant since 2009. Maybe Hawaii visitors and local residents don’t want another expensive, mammoth “entertainment center” in Waikiki. Is there a way to save the International Market Place? Is it an eye-sore or a Waikiki icon? What do you think? 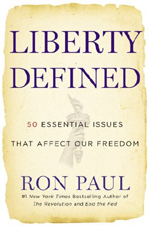 “Liberty Defined: 50 Essential Issues That Affect Our Freedom” (2011) by physician, author,Texas congressman, and 2008 presidential candidate Ron Paul presents “thoughts on a series of controversial topics that tend to confuse people” (page xvii). Paul begins by defining liberty as “to exercise human rights in any manner a person chooses so long as it does not interfere with the exercise of the rights of others” (page xi), with the understanding that “It permits people to work out their problems for themselves, build lives for themselves, take risks and accept responsibility for the results, and make their own decisions” (page xii). * Bipartisanship: We don’t need more “bipartisanship,” we need more confrontation! “When the ideas of both parties are bad, there is really one hope: that they will continue fighting and not pass any new legislation” (page 20). * Democracy: Democracy = mob rule.America’s goal should be spreading liberty, not democracy. “No system of government is a good one once the government grows too big and powerful. If the government is small and unintrusive, the form of government doesn’t matter that much. No one is seeking to overthrow the monarchy of Liechtenstein, for example” (page 63). * Marriage: There is controversy over the definition of marriage only because the government requires a license to get married and does not allow us to designate Social Security beneficiaries. * Patriotism: “Patriotism never demands obedience to the state but rather obedience to the principles of liberty” (page 218). * Prohibition: “Government should not compel or prohibit any personal activity when that activity poses danger to that individual alone” (page 229). * Public Land: The federal government owns more than a third of the land in our country, and most of it is not part of a national park. We should turn millions of acres over to the states, sell the land, and use part of the money to cover the national debt. Paul concludes with a list of ten principles of a free society, but there are a few issues missing from the discussion, such as the role of the United Nations and the Border Patrol (citizen militia). Remarks about “Earmarks” (guaranteed federal expenditures) are buried in “Executive Powers,” and are limited to the observation that “Voting against an earmark doesn’t save a dime – it only allows the executive branch to decide how the money will be spent, which is a clear responsibility of the Congress under the Constitution” (page 116). “Liberty Defined” has short chapters that are easy to read, backed by rational arguments and a compelling libertarian viewpoint. But the book seems like a political textbook or manifesto: because the issues are arranged alphabetically, there is no sense of priorities; and the writing is a little impersonal, with few of Paul’s personal experiences to connect with readers. Most of us are familiar with tips and tricks for dealing with holiday dinner left-overs, but today I want to focus on the hidden holiday left-overs: torn wrapping paper, ribbon scraps, crushed bows, empty boxes, used containers, greeting cards. All images are copyrights of their respective owners. Instead of throwing these neglected, ignored scraps away, let’s think of creative ways we can reuse and repurpose them to make new gifts or helpful household items. Disclaimer: I use brand-names with these ideas, but I’m not trying to promote these products and I’m not affiliated with the brands. I thought it was too cumbersome to say, for example, “tall, round stacked potato chip containers made out of cardboard with plastic lids” when I could just say “Pringles“! * Turn M&Ms Minis® containers into catch-all bins. These round plastic containers with hinged lids are great for storing small items like quarters (perfect for laundry days or feeding parking meters), paperclips, tacks, buttons, extra screws, toothpicks, cotton swabs, small craft supplies (like pom-poms and googly eyes), and more. Decorate them with stickers, your favorite photo, or wrapping paper. 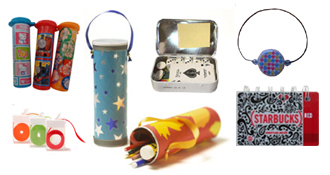 * Turn Pringles® containers or macadamia nut cans into carry-all cans. This idea from Better Homes and Gardens is a great way to store cookies or use as a coin bank! Clean stacked potato chip containers and lids, cover them with wrapping paper or kids artwork, and glue a ribbon around the tops and bottoms. Add ribbon or braided cord as a handle for a finishing touch. * Turn Tic-Tac® boxes into ribbon dispensers. Clean breath mint boxes, remove the labels, and add stickers of your own. Woman’s Day says that it works for narrow ribbons, and you can slip one end of the ribbon into the dispenser. * Turn Altoids® tins a first aid kit, a pocket games chest, or a pocket tackle box. Use Popsicle sticks and hot glue to make dividers. Then stock the tins with supplies, like band-aids and antibacterial ointment, dice and a deck of cards, or a set of fishing hooks. Check out The Art of Manliness website for 19 more ways to reuse these curiously strong mint tins! * Turn plastic bottle caps into fun jewelry. Find cool images from magazines, cut out 1” circles, and decoupage them to the tops of plastic bottle caps, suggest EarthyGirlOriginals. Add more decoupage and a gloss varnish over the images. Then hot-glue a colorful bead to the top to make a necklace or to the sides of the bottle cap to make a bracelet, and use hot glue near the beads to keep stretchy string in place. * Turn gift cards into pocket-sized notebooks. It’s a great way to save those artistic and clever gift cards (you can use card-stock greeting cards too). Greenbean’s Crafterole warns that it takes some effort, because you need a good binding system to punch holes in the gift cards, copy paper cut to size, and binding coils. How do you creatively recycle, repurpose, and reuse all those extra containers and holiday left-overs? You are currently browsing the Better Hawaii weblog archives for January 2012.